Audrey is now emphatic about everything; I tell you, she is SERIOUS! About…everything! Seriously! And "for reals!" Where does she get this stuff? FYI, Jacob has gas, and he doesn’t like it. Neither do I. 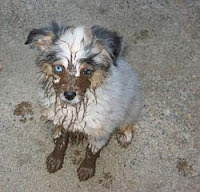 Remember this dog covered in mud in that one post I did? Well, I want this dog. Even if it’s covered in mud. It is so cuteness. At this time I have three zits on my forehead. If you drew lines to connect them, they would form a perfect isosceles triangle. I feel a homeschooling opportunity about to burst on the scene! I will make spam fried rice. And I am really excited about it. Thanks, wendiwinn!!! I hope you rig your giveaway so I will win! I couldn’t buy Girl Scout cookies when I went shopping as I didn’t have a debit card OR cash. I cried for 4 hours. My hair is Hot Mess. It blew around in the wind today as I was walking through a parking lot, and not even the wind could cool down its Hotness. I ache for women who walk into a building with an entirely different hairstyle than when they left the house. Some "super" model announced in the news (“news”, ha!) that she “eats like a pig”. I am pretty sure she meant she "eats like a bird”, because she eats a lot and yet stays skeletal thin and is thus light as a bird. Because seriously, have you ever seen a pig eat? Have you EVER seen a model eat??? I think Audrey got "serious" from me. Seriously. For reals. jacob's gas found it's way here. i don't like it either. who's this wendiwinn you're always mentioning? she sounds way awesome. for serious. i think the model meant she likes to eat pig. and by pig, she probably means the single bacon bit on her salad. hold the mayernaise. psh. models and their 'tan. I wish I lived close to you- I would bring you a PMS Survival Basket filled with chocolate and other fun treats/goodies. What?? Yoda?? What is it?? Must I check?? Did I???? I think there is a hair in my bra. It itches. Cream cheese frosting does not feel good when it goes up your nose. Trust me on this. I watched Step Up. Why can't I be blessed with mad dancing skills? I am sorry about the Girl Scout cookies:( I am still waiting for mine from my nieces. But that could be a good thing. I would just eat them for breakfast. I am having a minor giveaway on my blog. More like a minor garage sale. Check it out when you have time. Your mind works in mysterious and deep ways. Love the random thoughts...LMAO!!! Did you see my award to you on my blog? I'm pretty sure that super model isn't eating DELICIOUS Spam fried rice! Mmmm... I love Spam. Vickie, I am eating Vanilla Wafers for breakfast because there are no GS cookies...Vanilla is in one of the food groups, right? And Jennifer, because I am SO excited about the spam fried rice, I am prepared to give up my modeling career to eat it. There. Just did.